... you'll be pleased to learn that as of next Thursday Marks & Spencer will be selling a 75p jam sandwich featuring, er, bread, butter and strawberry jam. Apparently this is the "perfect quick fix, credit crunch lunch". I say it's a perfect way to show people just how much profit M&S makes from their sarmies. Anyway, as any child who grew up in South Africa knows, these won't be the real thing. 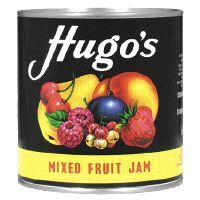 A real jam sandwich is made using two doorstep-thick slices of white bread and ladles of Hugo's Mix Fruit Jam ooozing out the sides (butter and or peanut butter optional).